Synopsis: In 18th-century Dover, the British navy is trying to shut down a smuggling ring that is illegally importing and distributing French wine. Captain Collier (Patrick Allen) believes the ring is centered in the small seaside village of Dymchurch. 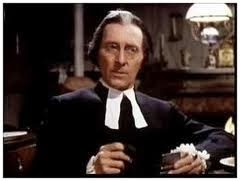 His search of the town turns up nothing, but he begins to suspect that the local vicar, the Reverend Doctor Blyss (Peter Cushing), knows more than he is letting on. One reason he suspects this is that despite Blyss’ assurances of cooperation, every villager claims they have no room to accomodate Collier’s men. Furthermore, Blyss had arranged for a Christian burial for the notorious pirate Captain Clegg, who died while imprisoned in Dymchurch; Collier doesn’t believe Clegg deserved any sort of burial, but Blyss says that Clegg had confessed his sins on his deathbed and therefore was awarded a proper burial. One of Collier’s men had once been a member of Clegg’s pirate crew. He had attacked Clegg’s wife and paid a terrible penalty: his tongue was cut out, his ears were cut off, and he was tied to a tree on an island, left to die. This crewman is now something of a dogsbody / mascot to Collier’s crew, but he has a tendency to get drunk and attack people. Upon seeing Dr. Blyss, he leaps upon him and tries to kill him. Stories abound in the village of the “Marsh Phantoms” — ghostly horses and spectral riders who look like scarecrows, who sometimes kill people who wander too far into the marshes. One of Collier’s men is killed, allegedly by the phantoms. Collier, who doesn’t believe such nonsense, is determined to find out just who or what is lurking out in the marshes. Meanwhile, it becomes clear that the smuggling ring is indeed centered in the town of Dymchurch, and that virtually everyone in town is part of it; Dr. Blyss is the mastermind behind the entire organization, the local coffin-maker keeps the liquor hidden and arranges transport, and the squires’ son Harry Cobtree (Oliver Reed) is Blyss’ right hand man. Cobtree is engaged to young Imogene (Yvonne Romain) who doesn’t know that she is the daughter of the late Captain Clegg. We also learn that Blyss, wearing scarecrow garb, is the leader of the Marsh Phantoms. But when one of Blyss’ men is captured by Collier he is forced, under threat of torture, to take Collier and his men to the secret hideout hidden in the marshes…. Comments: Hammer is best remembered, obviously, for its horror output but it actually toiled in a number of genres over the years and produced several ripping pirate yarns. Night Creatures was one of them. Its British title was Captain Clegg, and it was based on the popular Russell Thorndike swashbuckler Dr. Syn: A Tale of Romney Marsh. So why was it called Night Creatures in the U.S.? This was the title chosen for Hammer’s planned adaptation of Richard Matheson’s novel I Am Legend. When that film was scrapped, American theaters (having already been promised a Hammer film with that title) got this one instead. Being an American, I can’t really talk about this movie without bringing up The Scarecrow of Romney Marsh, which premiered (in serial format) on the anthology program Disney’s Wonderful World of Color in 1964. That adaptation of Thorndike’s novel starred Patrick McGoohan as Dr. Syn, pious vicar by day and leader of a band of masked outlaws by night. I remember being enthralled with the serial as a kid (Disney brought it back to TV regularly) though as an adult I was surprised to find I had misunderstood the entire story. No doubt due to the numerous tricorn hats in evidence, I’d assumed that Dr. Syn led a band of rebels against the British in the American Colonies. In fact, while the British navy is the antagonist, all the action takes place on the southern coast of England. 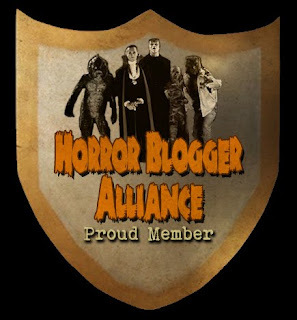 The whole production has that sumptuous look that Hammer pulled off so effortlessly in spite of modest budgets, and we have some familiar actors from the Hammer repertory company on hand. Peter Cushing, Patrick Allen, Michael Ripper, Yvonne Romain and Oliver Reed were all veterans of the studio’s horror yarns and they do quite well here, and Cushing in particular is splendid as the Scarlet Pimpernel-esque character, peering out from behind his spectacles as the fussy, querulous vicar, then pivoting as the film progresses to Concerned Father, Reformed Crook, Steely-Eyed Action Man and even Fantastically Persuasive Extemporaneous Speaker. It’s great fun. Synopsis: A funeral is being held for Barbara Carlin (June Lockhart), a woman killed in a stable fire on her family’s estate. But almost as soon as this fact is established, we learn that Barbara isn’t dead at all. She attends the funeral hiding behind a black veil, musing that her husband Rod Carlin (Mark Daniels) doesn’t seem very broken up about her death. When the graveside service has concluded, Barbara approaches the family attorney, Michael Dunn (Hugh Beaumont) and reveals to him that she’s still alive. She tells him that she believes someone started the fire in an attempt to kill her, but got the wrong person; the body recovered from the horse barn was burned beyond recognition and identified only by a diamond necklace that belonged to Barbara. Barbara is particularly troubled by the question of who was actually killed in the fire, because she thinks it might be her younger sister Rusty (Cathy O’Donnell). Rusty has a history of mental illness and often disappears for extended lengths of time. But she finds Rusty safe and sound, though still embittered that she was cut out of her father’s will because she was adopted. With Rusty eliminated as a possible victim, she goes to confront Rod, who claims to be delighted that Barbara is still alive — even though he has been carrying on with goodtime girl Helen Lawrence (Sonia Darren), who had previously told Rod that she’d like to be the next Mrs. Carling. Barbara had had a dalliance of her own with dim-witted palooka George (Greg McClure), who’d previously been seen around with Helen. Rusty still harbors a grudge against Barbara for stealing the big lug away from her, but it might be that Barbara was trying to save Rusty from a bad situation. Barbara finds there are plenty of people who might have wanted her dead. But not only does she not know who committed the murder, she still doesn’t know who the victim was…. Comments: Bury Me Dead is a a remarkably threadbare effort from PRC, a studio that routinely produced threadbare efforts. This one looks worse than a Monogram programmer, and that’s saying something. This film is so dreadfully chintzy that when the Carling family butler opens the front door it nearly bumps into the grand staircase. Barbara’s funeral scene is unintentionally humorous because the number of mourners was apparently limited to the principal members of the cast; there was clearly no money in the budget for extras. This greatly undercuts Barbara’s impish desire to see her own funeral. Considering the turnout, it probably would have been better for her to have stayed home. But of course Barbara has to attend her own funeral, because this is the man-bites-dog gimmick upon which the whole movie is based. It is, quite frankly, all downhill from here, because once the gimmick is deployed, a story has to be built around it, and one plot contrivance is piled atop another. 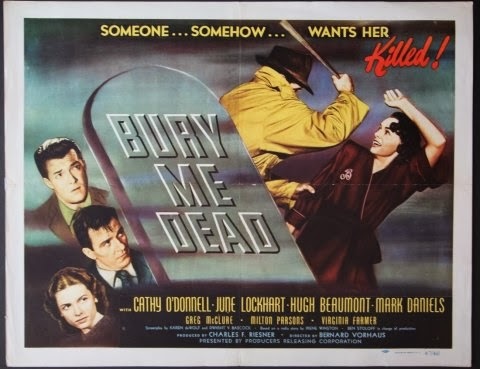 Bury Me Dead is usually categorized as a noir, but it clearly isn’t one; apart from the post-war release date and the fact that it’s a story about murder it really doesn’t have any trappings of the genre. It also has an odd, uneven sense of humor, at times making us think it’s veering toward farce. But it keeps moving grimly back to the task at hand, with pointless flashback scenes padding out its (68 minute) running time. This movie probably wouldn’t have been released on DVD at all were it not for the fact that its two leads, June Lockhart and Hugh Beaumont, are both remembered for their television careers. Both do just fine here — Lockhart was 22 years old when she made this picture and she carries the movie as gracefully as the script will allow. Beaumont is quite convincing as the sober attorney and family friend. The rest of the cast is pretty solid: Cathy O’Donnell is actually quite good as the tormented sister Rusty, and I found myself liking Sonia Darrin’s performance as Helen Lawrence as well. This release came on a two-movie disc from VCI Entertainment (the other film being The Chase). It’s an interesting disc because rather than a bare-bones release, this one comes with a commentary track for each film by Jay Fenton (credited as a “film restoration consultant”), as well as bios, image galleries and even a Superman cartoon! A nice job all around, and clearly a labor of love. Also if you have “CAPTCHA” on, you might want to turn it off… people hate it, okay I hate it. NIGHT CREATURES remains one of my favorite Hammers, Peter Cushing hugely enjoying his swashbuckling antihero, Oliver Reed enjoying a rare romantic lead. With Michael Ripper, Patrick Allen (ISLAND OF THE BURNING DOOMED, INVASION OF THE BODY STEALERS), Jack MacGowran (THE EXORCIST), and Martin Benson (THE COSMIC MONSTER, THE OMEN), it's clearly one of the finest casts ever assembled by the company. I hadn't even heard of BURY ME DEAD, apparently one of PRC's last releases, and the cast looks very interesting. 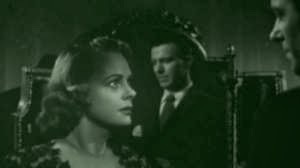 June Lockhart previously did SHE-WOLF OF LONDON, while Hugh Beaumont followed this by playing the villain in THE COUNTERFEITERS, opposite Lon Chaney and Scott Brady (in his film debut). I have seen lovely Cathy O'Donnell in THE STORY OF MANKIND and TERROR IN THE HAUNTED HOUSE, still shocked at her early death in 1970.